Contoh Recount Text - Sudah tahukah kamu apa itu Recount Text ? Recount Text adalah teks yang menceritakan sebuah cerita, aksi maupun aktifitas dan bertujuan untuk menghibur atau menginfomasikan kepada pembaca. 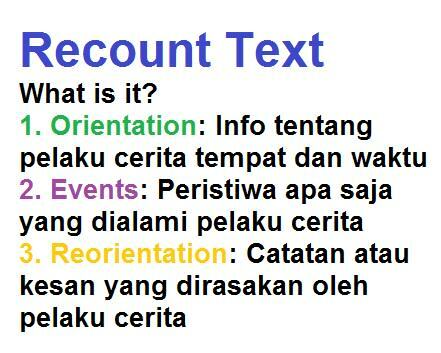 susunan umum dalam Recount Text biasanya mencakup : orientation, events dan reorientation. Last week my friend and I were bored after three weeks of holidays, so we rode our bikes to Pasir Kencana Beach, which is only five kilometres from where I live. When we arrived at the beach, we were surprised to see there was hardly anyone there. After having a quick dip in the ocean, which was really cold, we realized one reason there were not many people there. It was also quite windy. After we bought some hot chips at the takeaway store nearby, we rode our bikes down the beach for a while, on the hard, damp part of the sand. We had the wind behind us and, before we knew it, we were many miles down the beach. Before we made the long trip back, we decided to paddle our feet in the water for a while, and then sit down for a rest. While we were sitting on the beach, just chatting, it suddenly dawned on us that all the way back, we would be riding into the strong wind. On Sunday, I and my best friend, Sari, visited Semirang Waterfall in Ungaran. It was the first time for me to visit the waterfall. When we arrived at the hill, I felt so fresh and I could enjoy the scene. The air was so pure and all I could see only green and green. In Ungaran, we took a little bit trekking to find Semirang Waterfall. It was too bad for me because the distance to see the waterfall was too far. After taking so far distance, we found Semirang Waterfall. What a beautiful waterfall. We enjoyed the nice water in the rain forest surrounding the waterfall. Hearing the sound of falling water made me peace and relax. It was also excellent drowning out background sound. Playing with the water made me feel so happy. Finally, the time was over. It was time for us to go home. It was an unforgettable moment. I really enjoyed it. Itulah kumpulan Contoh Recount Text pendek yang bisa admin bagikan pada kesempatan kali ini. semoga dengan membaca contoh-contoh di atas, kamu bisa lebih mudah dalam memahami tentang apa itu Recount Text. sekian dari admin, semoga bermanfaat dan selamat belajar.